We tested the daytime TV product to see if it lives up to its claims. In our latest look at gadgets flogged via infomercial, George Block tests the Bell & Howell Tac Light Pro and discovers a rare example of a daytime TV product that mostly lives up to the hype. The ad for the Tac Light is a classic of the genre, featuring a highly-strung American in combat fatigues claiming the flashlight is like nothing else on the market. He reckons it’s essentially indestructible and bright enough that you can use it as a self-defence tool to dazzle unlucky miscreants. We were sceptical, as our recent trials of As Seen on TV and TV Shop products, including the Lizard Air Lounger, Paint Runner Pro, Big Boss Expandable Hose and Genius Garlic Cutter, have found they often aren’t as amazing as they appear on the telly. 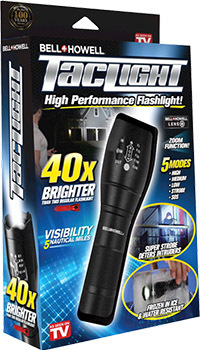 We tested the Tac Light ($50 including shipping from TV Shop, buy one get one free) against every claim made on the infomercial or on the packaging to see if it’s an exception to the rule. We switched the Tac Light on, dropped it into a full sink and submerged it in a saucepan of boiling water. 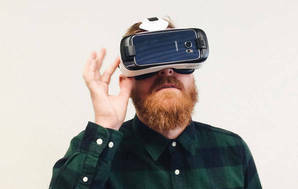 On both occasions it kept functioning at full brightness without allowing any water into the lens or battery compartment. We chucked it in a full container of water that we left in a freezer over the weekend. On Monday morning we recreated the scene from the infomercial where a hammer is used to smash the Tac Light out of an ice block. Sure enough, our model was still functioning. Some water made it into the lens and battery housing, but as the manufacturer only recommends short-term immersion we reckon that’s to be expected. Military Humvees weigh just under 2 ½ tonnes. We raised the stakes and repeatedly ran it over with an Isuzu ELF350 truck weighing 6.5 tonnes. While the Tac Light sustained no damage, neither did a $10 metal LED torch we picked up from New World. The Humvee test looks cool in an infomercial, but in this age of lightweight metal torches we don’t think it’s that impressive. ✔ 4. “Can be seen from 2 nautical miles away” (5 according to packaging and website) Five nautical miles equals 9.3km, the approximate distance between the end of Muritai Rd in Eastbourne, on the shore of Wellington Harbour, and Petone Wharf. Late one evening we stationed one staff member at the wharf and another at Eastbourne. The torch was easily visible, appearing much brighter than street lights, while the SOS flashing mode was also easily distinguishable. No further information is provided on what this “regular flashlight” is, apart from a generic picture of a small torch, so we measured its brightness against the $10 Eveready LED flashlight we ran over. At a distance of 1m, the Tac Light delivered 1510 lux (lux measures brightness, or lumens per square metre), compared to 144 lux for the Eveready. The Tac Light is 10x brighter, well short of the 40x claimed. Regardless, this is a very bright flashlight. Even when you “zoom out”, it maintains an even spread of light across the beam able to effectively illuminate a large area, in contrast to cheaper flashlights which are bright in the centre of the beam but taper off towards the edges. A Defence Force spokesperson refused to discuss the torches used by the New Zealand Special Air Service (NZSAS), citing operational security, but they did provide the specification sheet for the torch in general use by the New Zealand Defence Force. Called the Sidewinder Compact II and available on Amazon, it’s similar to the Tac Light Pro in that it’s a compact LED flashlight which claims decent water- and impact-resistance. Its maximum claimed brightness of 1175 lux at 1m is almost 30% dimmer than the 1510 lux we measured for the Tac Light. But as we couldn’t find any info on the torches used by NZSAS or American Green Berets, we’re unable to call this claim either way. Shining the torch directly into an unsuspecting subject’s eyes causes significant discomfort and leaves a lasting after-image, but it wouldn’t halt a determined attacker. The Tac Light’s brightness at 1m of 1510 lux is far less than the millions of lux generated at the same range by a military stun grenade, or the tens of thousands of lux generated by a camera flash. We don’t recommend relying on dazzling an intruder with a torch as a method of home security. Not quite. Thanks to the advent of inexpensive super-bright LEDs, there’s been a surge of “tactical flashlights” available on the market. In general, “tactical” means the torch claims to be suitable for extreme situations, like during a disaster or for self-defence. The Tac Light Pro claims to have a total light output of 600 lumens. While that’s very bright, there are even brighter flashlights available. For example, torchmonster.co.nz sells 900 lumen tactical flashlights for $99. Many outdoor stores also sell water- and impact-resistant high-brightness flashlights, including the LED Lenser P3 and Macpac’s Optic Torch, though these torches produce less than 200 lumens. While the Tac Light doesn’t satisfy all the outlandish claims made in the infomercial, it’s a very good torch overall: highly-durable, compact, lightweight and seriously bright. It’s also relatively inexpensive for a rugged, high-brightness “tactical” flashlight. We think it’s a good option for your emergency kit, or for keen trampers/campers and those who live in rural areas. I have just bought a small LED torch from the local $2.00 shop. It has no batteries, has 3 quite bright LEDs, not as powerfull as the Tac Light Pro BUT as with most torches that run on batteries all the normal torches suffer from flat batteries when most needed, this $2.00 torch has a small hand generator which can be squeezed to recharge, however i have had one of mine for 2 years and have used it for extended periods of time (1 hour alone in the waipu caves ) plus lots of periodic use and have never had to recharge it, fantastic for emergencies of the earthquake type etc. I have one in the glove box in the car, another two in my caravan, one in my workshop, one each beside the bed in the draw, as i reckoned the massive layout of aprox $12.00 made the outlay very worth while. Having to pay $50 for a Tac Light Pro or similar that runs out of batteries seems a waste of money. Be good to see a review of head torches suitable for mountaineering comparing the brightness, brightness over time, effective distance illuminated, weight, robustness, battery types, n recharging options. I have had a few Cree LED Torches in the last 5-6 years. The best is the Nitefighter F30B that I got from Banggood.com for NZD$20. It uses a single 18650 (rechargeable) battery and is quite small and light. At night it puts out a bright centre beam that has a good range and a wider beam to light up the immediate vicinity. The torch is very practical and I highly recommend it. I suggest buying an 18650 battery and charger in NZ. I would like to see how this compares to the Tac Light Pro. We purchased the Tac Light from Countdown because of its waterproof credentials. The first time we took it in the water to look at a sea cave it took on water. The salt water and the electricity did an accelerated rust thing and the Tac Light died. This torch is not able to withstand simple tepid sea water. Luckily I had kept the receipt and got a full refund from Countdown. Lucky also we only had one cave to explore!!! I do not recommend this bit of junk. We agree that the GWRC’s information from its test last year is excellent. We currently have a test of bike lights underway that will incorporate many of the newest models in the market. The results for this will be online mid-April to coincide with daylight savings. Hi - I would like to see trials or comments done on the 'As seen on TV' Renovator Transforma ladders. We may be in the market for a new ladder and we wonder how this measures up against those tested by Consumer. We’d like to run another test of multi-purpose ladders this year but have no ladder tests scheduled as yet. In general, we’re not that keen on multi-purpose ladders. In 2005 we tested six and found none passed the voluntary standard for portable ladders. In 2012, the Commerce Commission banned them from sale unless they passed this standard. Then, in 2015, Brand Developers Limited (TV Shop) were fined 150k for selling Transforma ladders with a load rating of 180kg despite them not having been tested to all parts of the standard. In further testing at 180kg one ladder deformed. They now aren’t sold with this claim. We think your best bet is buying a good folding ladder and a good stepladder, rather than a multi-purpose ladder. But if you’re really keen on a multi-purpose, make sure it has a sticker saying it complies with AS/NZS 1892.1:1996. I have a couple of these - except I bought them on aliexpress for about $15 NZD delivered. Compared to a Led Lenser, very poor beam quality, although more water resistant. Nothing special at all, but at $50 for two, delivered, I guess that they do represent reasonable value for money, after all, a similarly bright Led Lenser would set you back more than $50 for one I suspect. Plenty of very good torches out on the market now however, but you need to do a bit of research to find which one is the one you want. I have a similar view that this is grossly overpriced. I've read reviews on a specialist site, nothing special here. I've bought a similar light for ~NZ$10, not really worth any more than that. 600 lumens is not bad, but I've read tests showing the Tac light is more like 300 lumens. Either way I've got several lights that put out over 1,000 lumens, including a Convoy L6 that puts out 3,800 lumens. I'm confident that most decent lights would easily pass the same tests that the Tac Light Pro did. I'd agree that the Tac Light Pro is not a terrible light, probably quite usable in a wide range of situations, nothing really wrong with it. But I could buy lights that would match it in performance from any one of several Chinese direct sales sites for under NZ$20 with free shipping worldwide. With zooming lights like this you would get less total lumens output when zoomed in, not a deal breaker but just a performance aspect to consider.